Sophomore MacKenzie Slagel at one of the cheer competitions this year. This is Slagel's second year with the Starr’s Mill varsity team and fourth year with the Stingray Allstars in Marietta. Competitive cheer is preparing for the state competition held in Columbus this weekend. 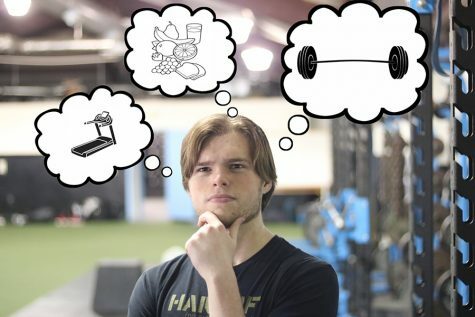 However, that preparation comes at a price, especially for those whose passions extend beyond the Starr’s Mill athletic complex. When the season began, competitive cheer coaches Heather McNally and Todd Saye sat down with their seniors and asked them what they wanted for the 2018 season. Their answer? To give them the hardest routine yet: including the obstacles, the pain, and challenges. 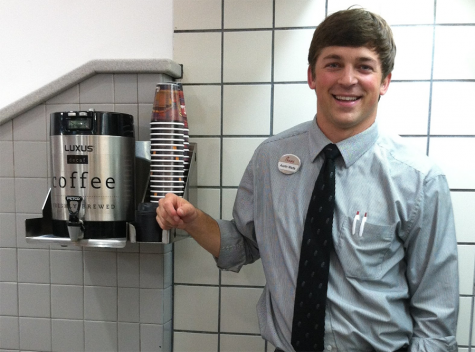 For some on the team, however, the routine itself may not be the biggest hurdle. Some of the most talented competitive cheerleaders here at Starr’s Mill compete not only with the high school team, but also with the Stingray Allstars in Marietta. 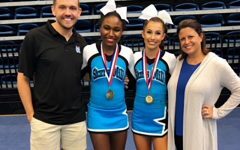 The Stingrays are one of the top competitive cheer teams in Georgia, and when their cheer schedule collides with the Starr’s Mill practice and competition schedules, it can be almost too much to handle. Before the 2018 season began, six of the Mill’s cheerleaders were also competing with the Stingrays. Now, as the Panther cheer team prepares for their final competition, all but one of them has quit the Stingray team. Starr’s Mill has cheer practice everyday after school for about two hours and has competitions every Saturday until state competitions. The Stingrays have practices lasting three hours on Sundays, Tuesdays and sometimes on Saturdays, but their practices are much more difficult and involved than at the Mill. The amount of Stingray cheer competitions vary each year, but this year there are eight. Senior Kristen Decos (right) during a cheer routine. This is Decos’s fourth year with the Starr’s Mill team, second year on varsity, and has recently stopped competing with the Stingray Allstars. Senior Kristen Decos, though having experienced a lot, almost couldn’t handle the stacked-up cheer life. Decos, who is a main base, competed with the Stingrays for one year and has been competing with Starr’s Mill for four years, two of those being on varsity. After working with the Stingrays, she found the colliding schedules and physical and mental demands to conflict too much with her regular school work. 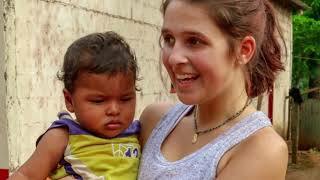 Although Decos has decided to not compete with the Allstars, she still values the experience. When participating in both cheer groups last year, homework was extremely difficult as some nights Decos would not get home until midnight and still had all of her homework to complete, including that from her first AP class. Academic life wasn’t the only challenge Decos faced last season. She also struggled to balance her social life, which is one of the reasons why she decided not to do both cheer teams this season. “I wouldn’t say that school cheer is just cheer, but doing both is just cheer. I mean, you don’t have a life,” Decos said. With such a strong passion for cheer, along with the honor of competing at an allstar level, Decos is considering going back to the Stingrays after the school season ends in November. “You sacrifice so much to do what you love,” Decos said. The only Starr’s Mill cheerleader still with the Stingrays is sophomore MacKenzie Slagel who is a backspot for both programs. This is her second year on the Starr’s Mill varsity team and fourth year with the Allstars. “It’s personally satisfying knowing I can compete at the high school level and all-star level and excel in both,” Slagel said. 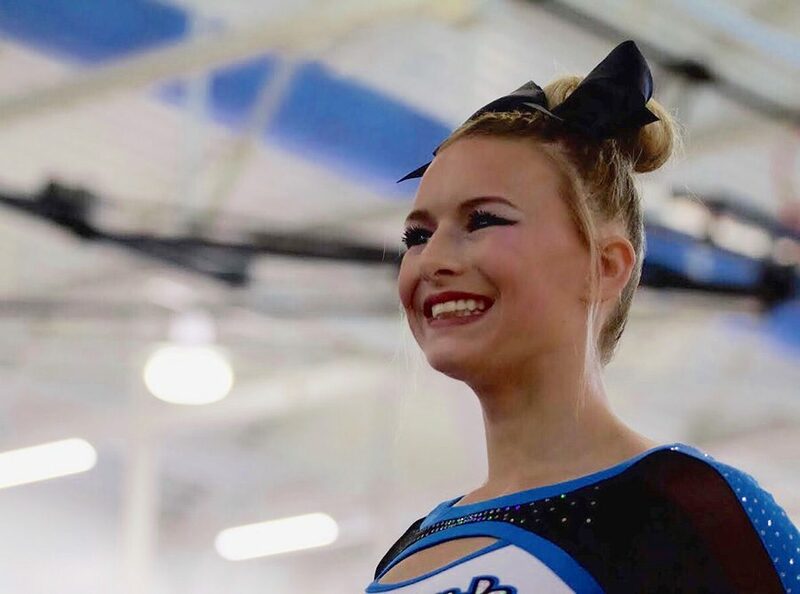 Balancing school and social life with cheer does pose some difficulties, such as making time for homework and having time to simply be a teenager, but Slagel seems to have found a balance that works. She tries to get most homework done either at school or in the car as she rides up to Marietta, and although her social life is a tight squeeze, she finds comfort through friends and cheer. “It’s hard to be a regular teenager and be able to hangout with my friends on the weekends, but I love what I do and I love both of my teams so it doesn’t really bother me,” Slagel said. 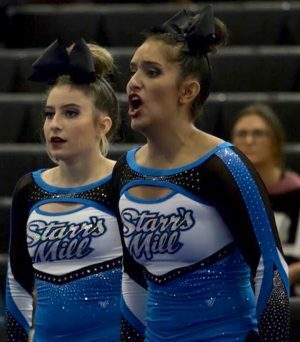 Despite the struggle of finding a balance in life, what propels not only these cheerleaders, but all of the cheerleaders on the Starr’s Mill team, forward is their love and talent for their sport. This passion can be seen this weekend at the team’s final competition of the season. 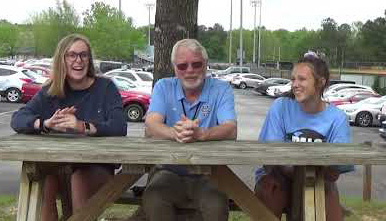 Last weekend, Starr’s Mill accrued its highest score of the season en route to winning the Region 3-AAAA title. Winning the region grants the team a bye through Friday’s sectionals and gives the team an extra day of rest ahead of Saturday’s GHSA State Championship at Columbus High School in Columbus, Georgia. Thank-you Prowler for Supporting Starr’s Mill Cheer!! !